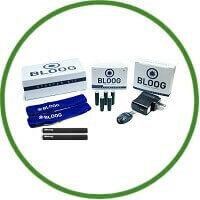 Bloog e-cigarettes seem to be picking up in popularity lately. It was proudly made in the U.S., simple to navigate, and overall very clean in appearance. The Basic Starter Kit and was impressed by all and is relatively an inexpensive starter kit. 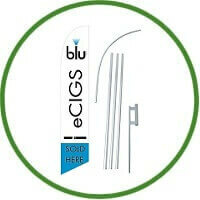 Bloog e-cigarettes seem to be picking up in popularity lately. Bloog was proudly claimed that everything was made in the U.S., simple to navigate, and overall very clean in appearance. The Basic Starter Kit and was impressed by all of the options they provided in this relatively inexpensive starter kit. It comes with one 78mm battery, five cartomizers, battery pouch, and a USB + wall charger, which is pretty standard fare for a starter kit. However, instead of being limited to one colour or one flavour or cartomizers, there are 9 battery colours, 16 flavours, and 6 nicotine strengths to choose from. If you are new to e-cigarettes and vaping, you’d know that getting to really customize your selection like that is not usually $39.99, like this one. The actual battery and cartomizers looked great. Puffing on it proved to be as pleasant an experience as looking at it. The vapor produced was bountiful, smooth, and easy to inhale and exhale. In comparison with similarly priced and styled e-cigarettes, it seems to be right on standard. The flavour selection they have is pretty big. There are seven fruit flavours, four dessert flavours, and eight tobacco flavours. This gives Bloog a bit of an edge over a lot of competitors, who only offer one or two regular tobacco, one menthol, and maybe two dessert and fruit flavours. Having the option to try and like a new flavour can allow smokers using an e-cigarette to stay away from real ones and sample something different if boredom sets in. Offering a wide array of nicotine strengths also makes it easier if you are replacing real cigarettes with e-cigarettes. This selection is one of the few things that set Bloog apart. Even though it is well made and offers great vaping, so do quite a few others out there that are similarly priced. I think that those that are new to e-cigarettes would do well to give Bloog a try, and that they should work hard to sell to that market, while offering their clearomizers to the more experienced crowd.